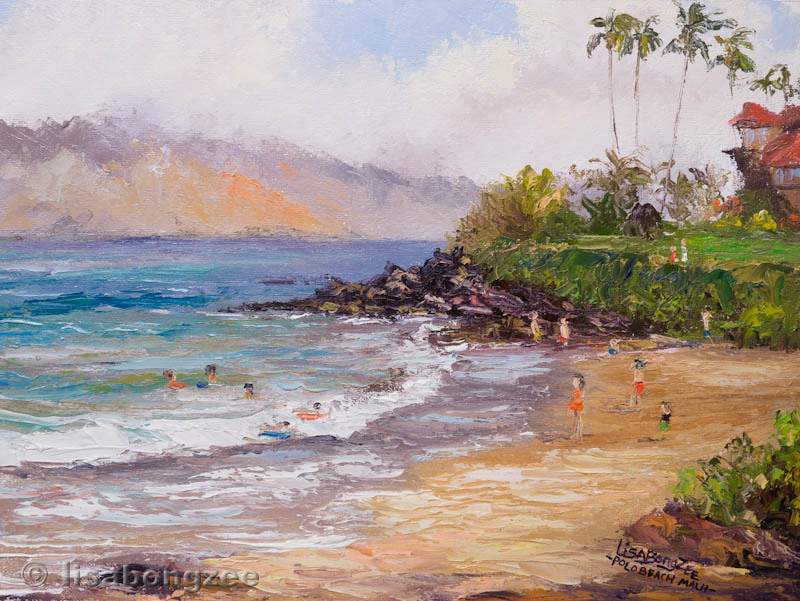 Kapalua Beach, on Maui’s northwest shore, is a beautiful place to spend the day. The water here has gorgeous shades of deep blue and turquoise, and the calm, clear conditions make it a snorkeler's Paradise! 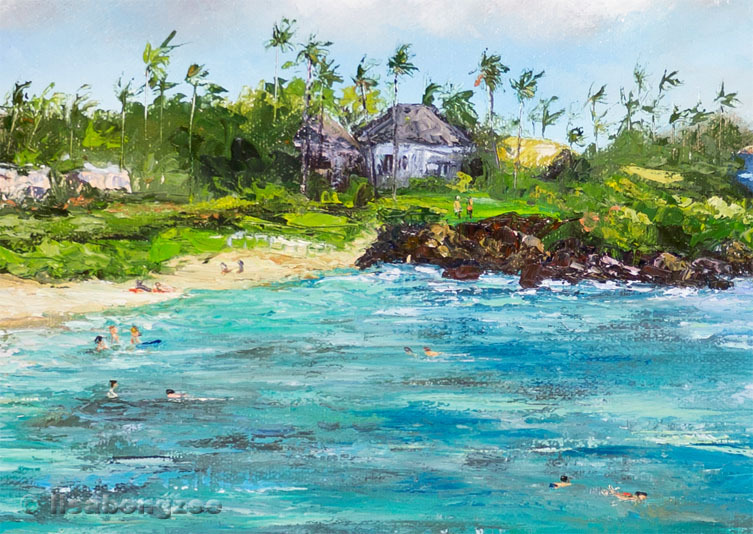 “Kapalua Blues” is a 10 x 30 palette knife painting. Here is another plein air day spent at one of my favorite beaches. Makapu'u Palette Knife Plein Air 9" x 12"
Last weekend I participated in my first “Plein Air Paint Out”. 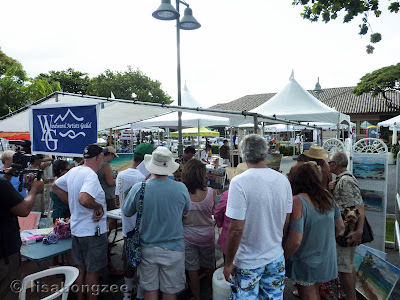 “Cool Kailua Nights WAG booth” for judging in the afternoon. 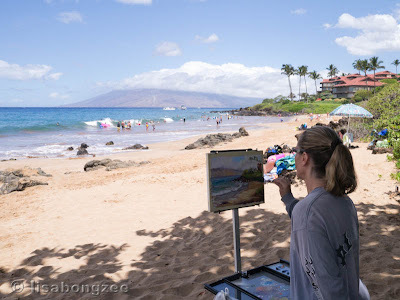 The only goal I had in mind was to complete a plein air painting that I was happy enough with to turn in to the event. 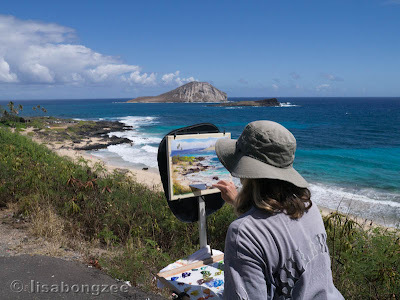 I picked a spot near the entrance to Lanikai with a great view of the Mokulua’s and some interesting tidepools. 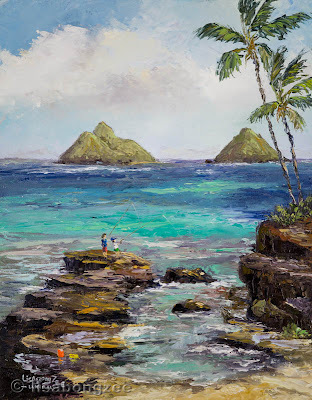 Below me, a young boy and his Dad were fishing from the rock ledge. You could tell that the boy was trying his hardest to catch a fish before his Dad did. I decided to include them in the scene. While I painted, the boy did catch a colorful little reef fish and did a good job of letting everyone around know that HE caught the first fish! 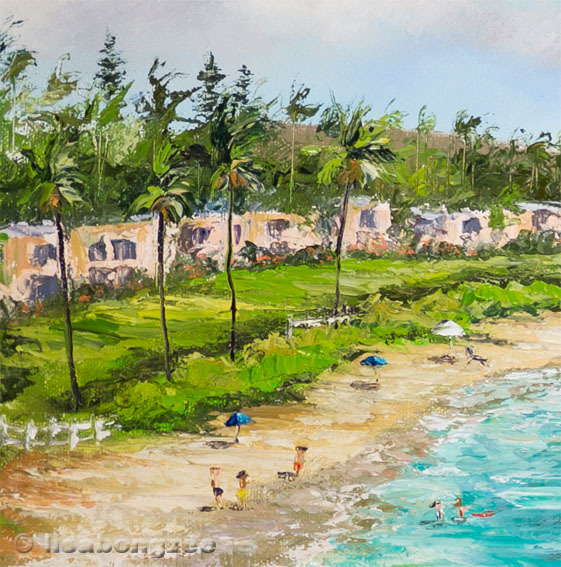 I finished up my painting and was satisfied with it. 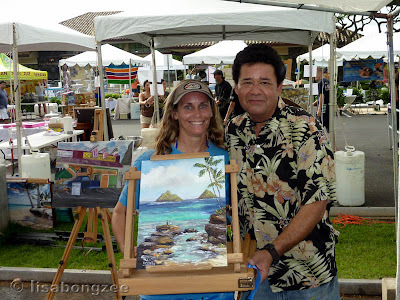 I named it "Beat Dad To The Big One". 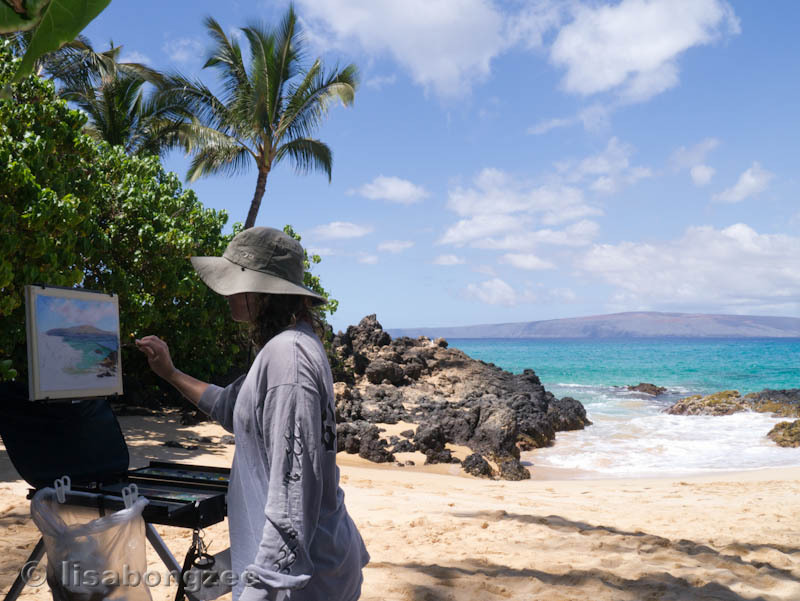 There were so many beautiful paintings created that morning. I was happy to just be able to be a part of it. 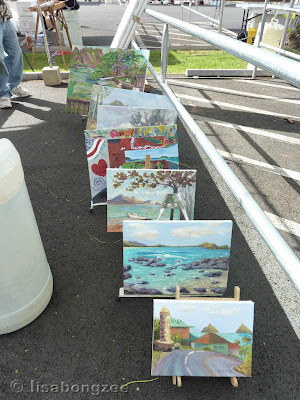 As the juror read off the winners, I gasped! 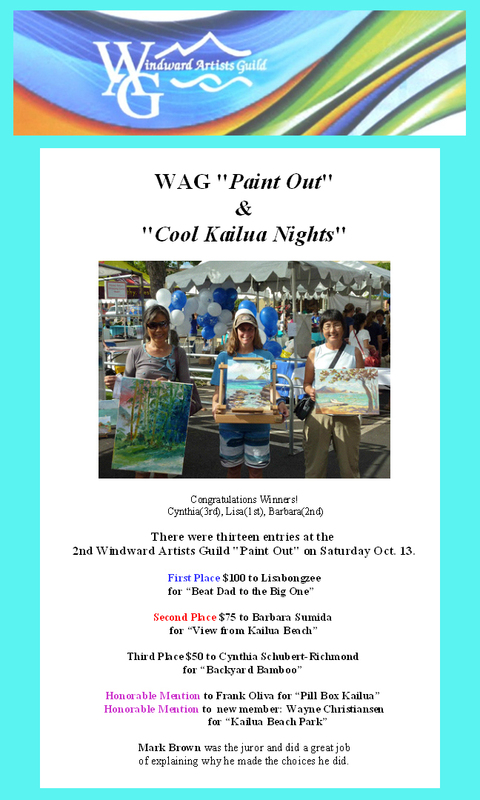 “Beat Dad To The Big One” took first place! I wouldn't be more surprised than I am now." And if that weren’t more than enough already, my painting sold that same day! 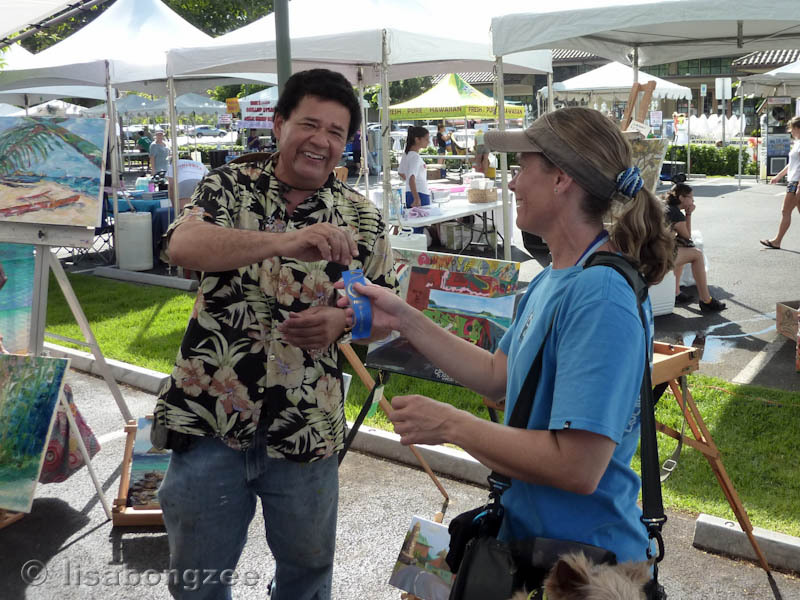 Much Mahalo to juror (and one of Hawaii’s top plein air painters), Mark Brown, for donating his time to help set up and judge this event. Also, thanks to all the great staff of the Windward Artist’s Guild for creating these paint outs and helping to promote the arts in Hawaii. 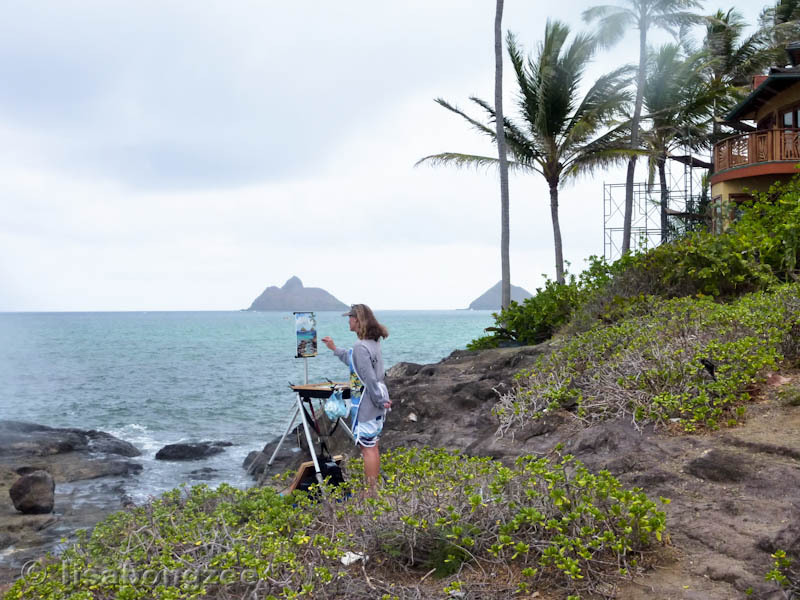 What a wonderful experience and great motivation to keep on plein air painting! 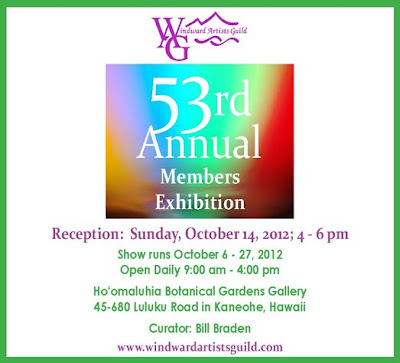 The “Windward Artist’s Guild” is holding their 53rd Annual Art Exhibition at the Ho’omaluhia Botanical Gardens gallery. I am thrilled to have four of my latest palette knife paintings on display in this collection. 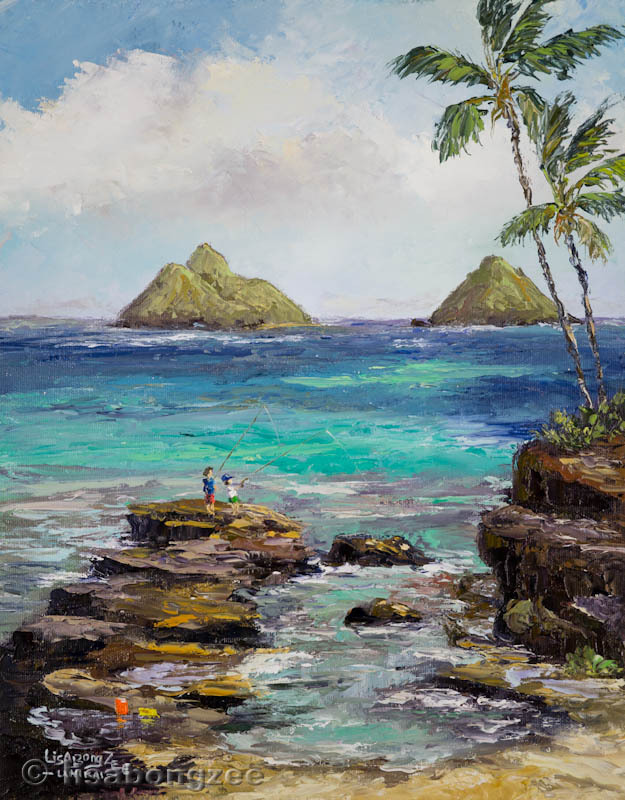 The exhibit runs daily through October 27th, 9 a.m.- 4 p.m.
Mahalo to curator, Bill Braden, and “Windward Artist’s Guild” for putting together this great show! If you are in the area, stop by and check it out. There are so many wonderful works of art to enjoy, not to mention the beautiful lush tropical grounds of Ho’omaluhia. And it’s all FREE! 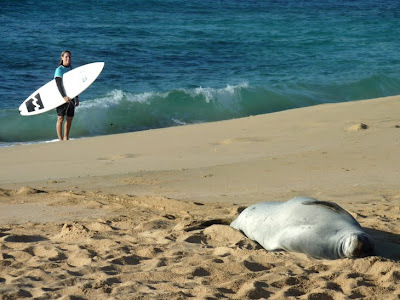 Dean and I often try to get a quick surf in before starting work for the day. Being out in the water to see the sun pop up over the horizon is something we look forward to. Today was one of those exceptional mornings when I am so thankful to be living in Paradise. We paddled out before dawn. 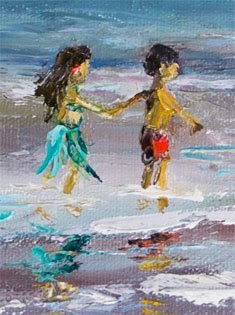 The water was glassy and the waves were fun. The voggy sunrise was absolutely gorgeous, and the giant seabirds were swirling overhead. Two honu (turtles) popped up nearby, and then as it was time to head in, we were welcomed by Irma and Benny. 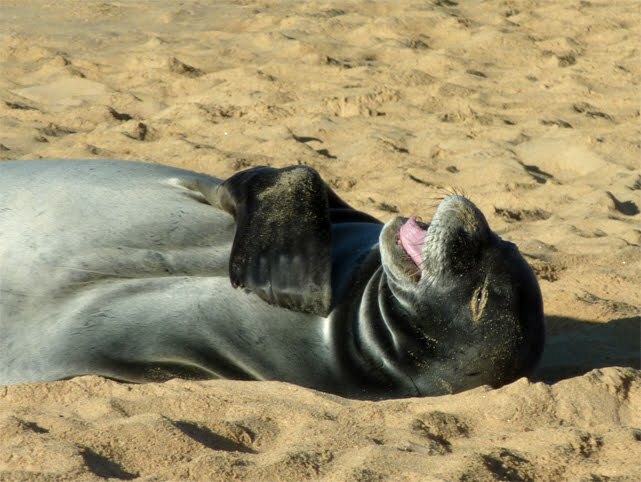 "I am Irma....Hawaiian Monk Seal. It's a rough life but somebody's gotta do it!" 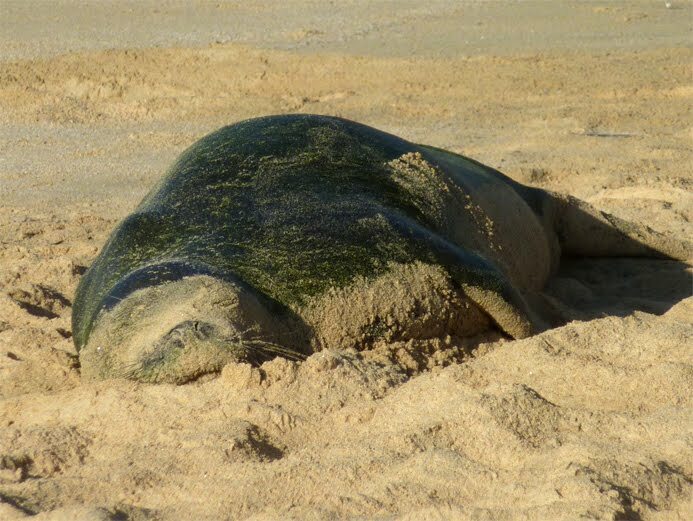 Benny was swimming around while we were out surfing, and then decided to follow us in and catch some rays with Irma. Can’t think of a much better way to start the day! 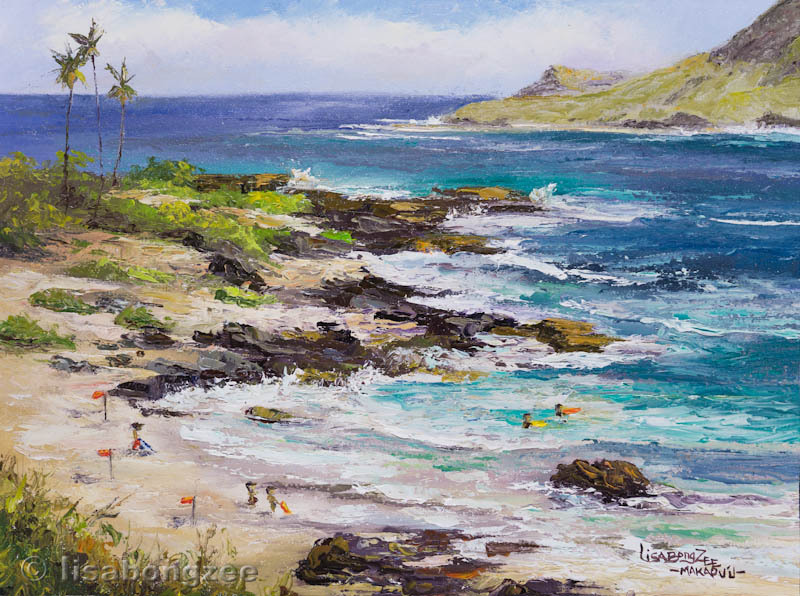 on the windward side of Oahu, Hawaii. They recently expanded and the place looks awesome! 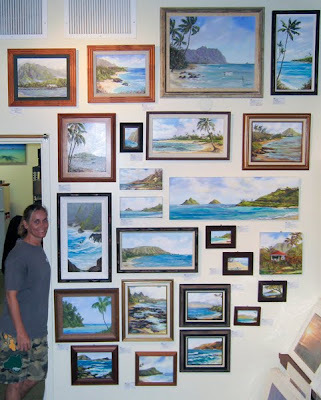 Be sure to check it out next time you are in Kailua. There are so many amazing creations from hundreds of local artists, it is a fun way to spend an afternoon. 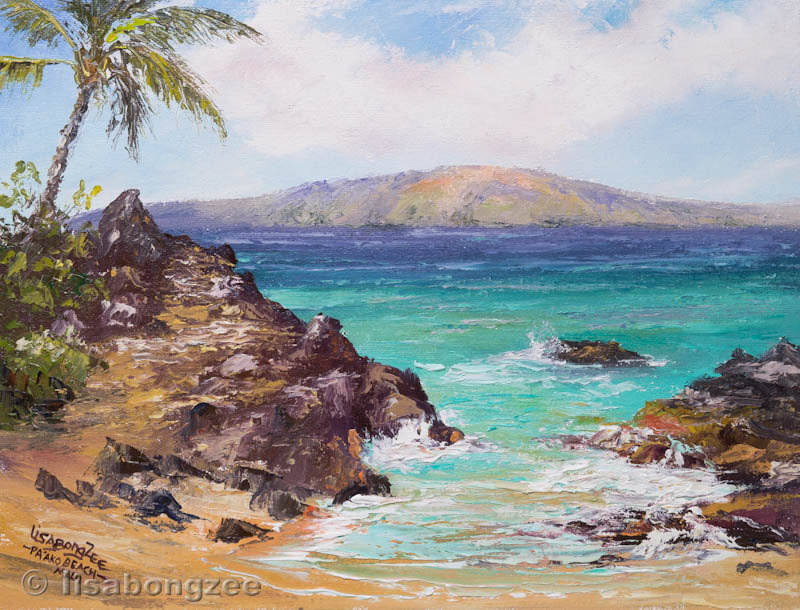 is a scene of one of my favorite beaches to paint on Maui. 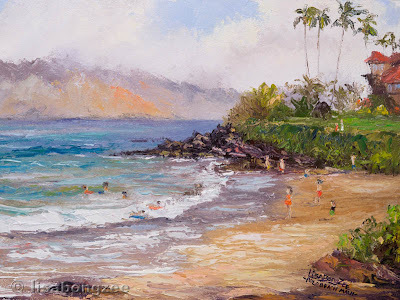 The scenery here is gorgeous, and whenever I visit this beach, it is always sunny and filled with people having a great time! Below is a plein air painting I did at this same beach last August. Last year, I plein air painted here using brushes. 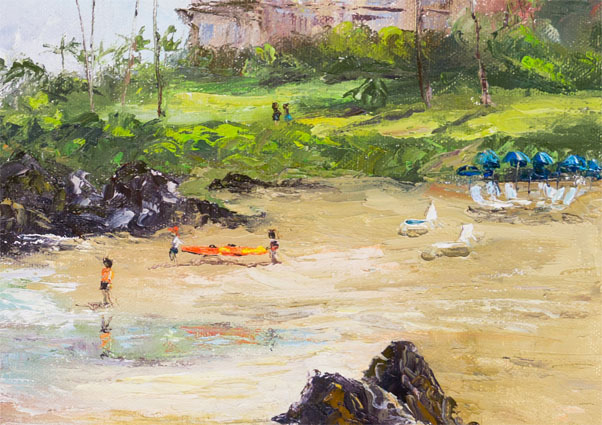 This time, I used only palette knife and came up with this little plein air painting.